One main lesson I’m learning in my frugal adventure… the better I stock my pantry the quicker I can make a delicious and wholesome meal. I typically try to stock my pantry with a variety of convenient foods and pantry staples that I can grab quickly when I’m planning for the week. Depending on what’s on sale, I try to purchase more of these staple items to save money. Pasta, rice, marinara, broth, and salad dressing are all must-haves in my pantry. Basil pesto is also a good item to have. It’s a simple delicious stir-in for pasta, salads, and sauces. Check out how to make and freeze your own Basil Pesto for a quick fix in a meal. 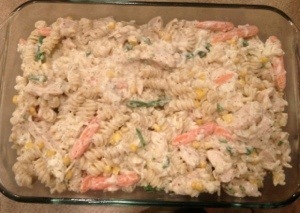 This casserole is a tasty one I found in Sandra Lee’s Semi-Homemade Money Saving Meals recipe book. 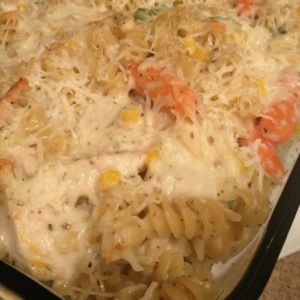 It turned out really good and makes a quick freezer friendly go to meal as well. Preheat oven to 375 degrees. In a large pot of boiling water, cook pasta for 7 minutes. Drain and set aside. 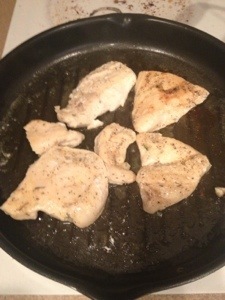 Meanwhile, cook and cut chicken into 1 inch pieces. In a covered, microwave-safe dish, microwave vegetables on high setting for 6 minutes. 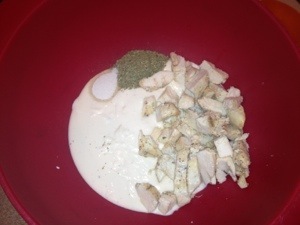 In a large bowl, stir together Alfredo sauce, Italian seasoning, and garlic salt. 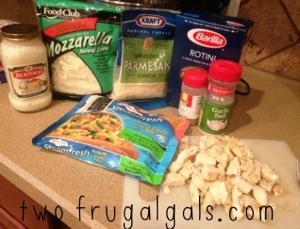 Add pasta, vegetables, chicken and mozzarella cheese, fold to combine. 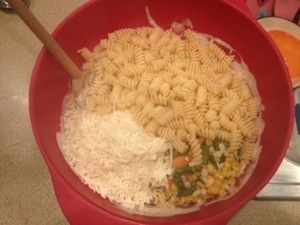 Transfer to a 3-quart casserole dish; sprinkle with Parmesan cheese. Cover and bake in a preheated oven for 45 to 50 minutes or until heated through and bubbling.